What is Middle-aged? What is Old? #Midlifing: How do you know when you’ve hit it? I remember going to the 40th reunion of my high school class where I attended my first three years of high school. I took a look around at the gray hair and wrinkles and tried to see in their faces my high school chums. I couldn’t recognize some of those I hadn’t seen in 40 years. Did I look equally different to others? I truly wondered if I looked as old as them. This is a common experience for most of us. I began writing this newspaper column in 1987 (not this specific column, but the weekly editions), which was a year after we gave birth to our youngest daughter. So I was still a fairly young mom at the time, (or older mom, depending on your viewpoint, to be having babies from age 30 to 35). At any rate, we ended up with three kids age five and under after that final blessed birth event. This helps to explain why as I approached my 40th birthday with my youngest child just starting kindergarten, I definitely did NOT feel middle-aged. Who said 40 was middle age anyway? If you are unlucky enough to drop over from a heart attack in your 50s, then 40 is downright elderly. If you live to be 100 or 105, which is more and more common, then at 40 you’re just getting started. But the good Lord provided that we truly don’t know these things—unless we draw the terminal-illness-at-an-early-age-card, which too many, tragically and sadly, do. 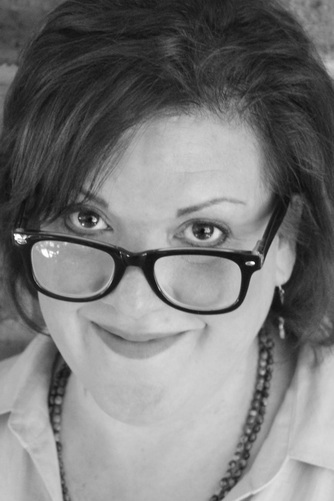 So along comes Jennifer Grant, a former columnist for the Chicago Tribune and a funny and prolific writer for magazines and blogs, and with books popping out like rapid babies. 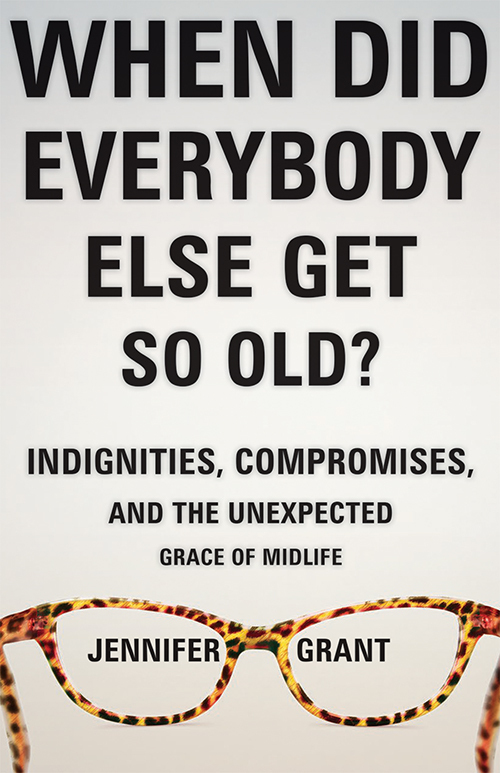 Her newest book births May 2 from our office called When Did Everybody Else Get So Old: Indignities, Compromises, and the Unexpected Grace of Midlife (Herald Press). I’ve been blessed to work with Jen on the editing end of her book, passing her baby from copyeditor to designer and through first and second proofreaders, and so on. Jennifer writes funny—not weird funny, but laugh out loud funny. If you’re anywhere near 40 and up, you’ll love her looks at the transitions of middle age such as the children growing up, feeling inadequate and not as successful as others in your field, going through hormonal swings, and your teenager being embarrassed by something you’re wearing. Been there, done all that. According to my teenage daughter, I look not only old but also weird in my new glasses. I admit that the woman at the optometrist’s office did mention that not everyone can wear these particular frames, but she assured me that I could. And I quote: “Not everyone call pull off those frames, but you? You’re rocking them!” I walked out of that office with a little spring in my step. A few days later, unbespectacled at the time, I drive my daughter and one of her friends to Starbucks. They sit together in the back seat of the car, looking down at the screens on their phones. “My mom has ‘new glasses,’” my daughter announces, apropos of nothing. She speaks the words “new glasses” in gigantic air quotes to underscore her disdain (Grant, p. 85). She also writes oh so poignantly about an absentee father, her sister who she and a brother often had to rescue after evictions or hospitalizations; the sister ended up dying young of cancer. She writes of an 11-year-itch when she and her husband decide to have marital counseling. If you’ve ever pondered “Who have I become?” “Is this all there is to life?” “How do I relate to a God I understand less now than I used to?” or ever asked “Now wherever did I put my reading glasses?” you might enjoy Jen’s book. And if you go looking for the book: look for a book with funky glasses on the cover and title in really big print. The serendipitous thing about this book is that since we are all aging, Jennifer points to the confidence and grace that this season of life can also bring. She reminds us that midlife is the time to leave regrets behind. It “isn’t the time to make excuses or ruminate. It’s time to move on, with hope” (p. 173). She quotes Solomon in her last paragraph, “What we can do is eat and drink and enjoy the fruits of our labor, knowing them to be gifts from God” (p. 178). What things told you had hit (or are coming up on) midlife? Send your comments to anotherwaymedia@yahoo.com or Another Way Media, Box 363, Singers Glen, Va. 22850. Or, find more about the book at store.mennomedia.org.